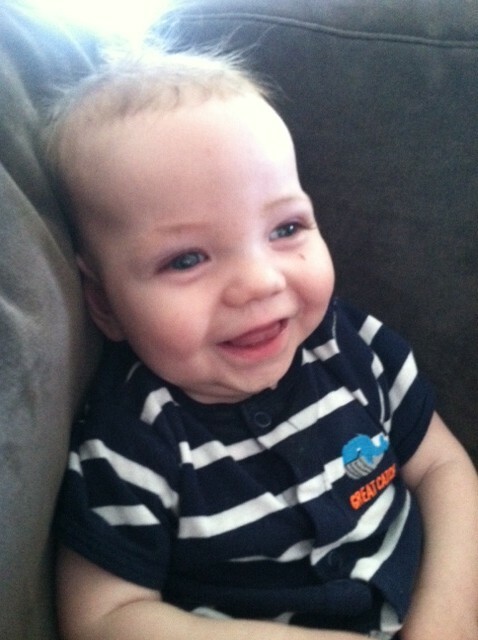 Beckett turned 9 months old last Thursday…so I’m only running 4 days behind this month! That’s impressive in itself!! He had a pretty awesome month. He’s gaining lots of weight finally, “talking” so much more, and is generally a happier baby that he’s ever been. We have a full month off from follow-up appointments (his next isn’t until May 31), so this month is just PT and vision therapy. He had a fantastic weekend full of smiles. I took both kids to a friend’s house to play with a bunch of other kids on Saturday. 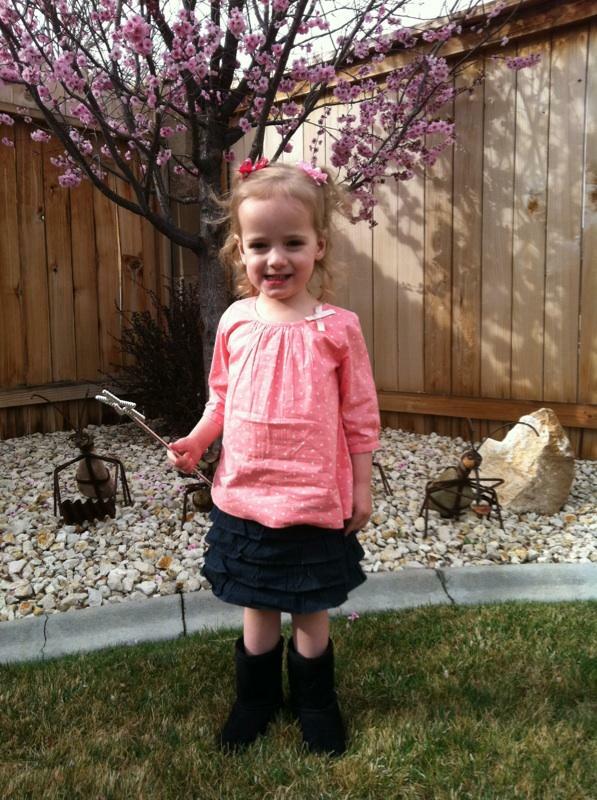 Both Beckett and Addie had a blast and the weather was simply perfect! And, funny enough, both had completely meltdowns when it was time to leave – Addie didn’t want to go and Beckett was hungry. Once fed and cleaned (Addie came home with an entire sandbox in her hair! ), both were happy again and we enjoyed a quiet afternoon at home. Notice the war wound on Beckett’s cheek…his friend at daycare (the little girl who is nearly his exact age) has just learned to crawl and makes a dash for Beckett every time he’s lounging. She throws herself right on top of him, like a wrestling move. I keep telling him he needs to learn to crawl so he can escape. So far, he’s not listening! 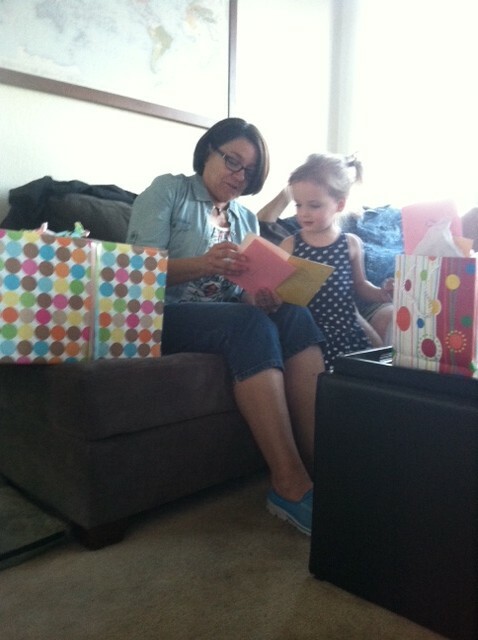 On Sunday, we invited the family over to celebrate my mom’s birthday. Can you believe she’s 60 years old? Grom would always make her favorite chicken and dumplings and carrot apple salad. I tried my best to channel my inner grandma and reproduce her amazing meal. I think the chicken and dumplings weren’t too far off (though in full disclosure, I found a recipe on pinterest as her book of recipes only had the dumplings, not the soup), and I opted for yogurt instead of mayo in the carrot apple salad (I have a serious aversion!) so it wasn’t an exact replica. The caramel cake though, big fail! It still tasted fine, but the frosting was more of a glaze. Certainly not “run your finger around the bottom of the cake” worthy. My cousin Jason would have been so disappointed. Regardless, we had a great time and enjoyed the company of Trish & Ed, Pam & Ken and of course, Auntie Lyssa and Papa. We’re continuing the celebration in a couple weeks with a family trip to Bodega Bay. Lyss needs to finish her finals first! Can’t wait for a little vacation with my wonderful family! Happy birthday, Mom!!! I swear, Addie’s social calendar is busier than mine and Jimmy’s! 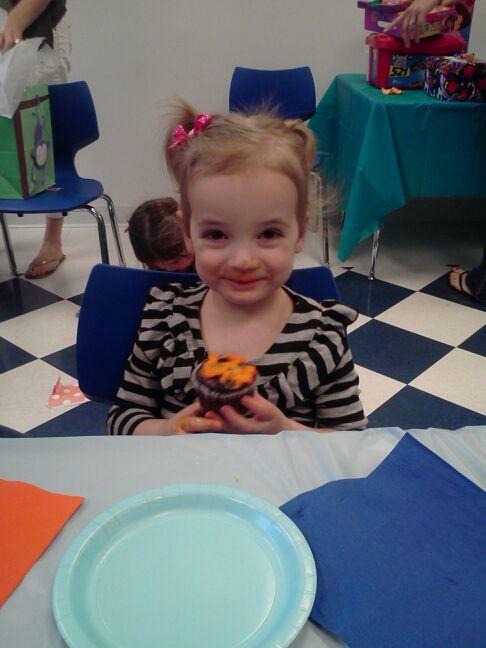 She went to two birthday parties (for three friends!) last week alone. On Friday, she celebrated Simon and Maggie’s birthdays at the Discovery Museum. Mom had to work, so it was Addie/Daddy day. Looks like they had a good time! 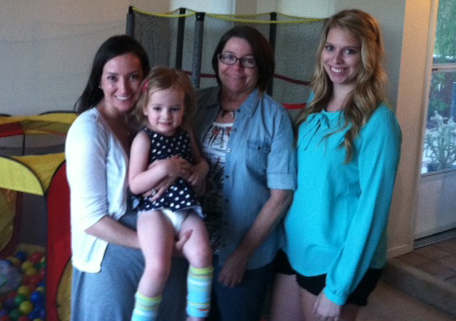 We had our typical Saturday filled with gymnastics and laundry, then Sunday, we celebrated Miss Mia! 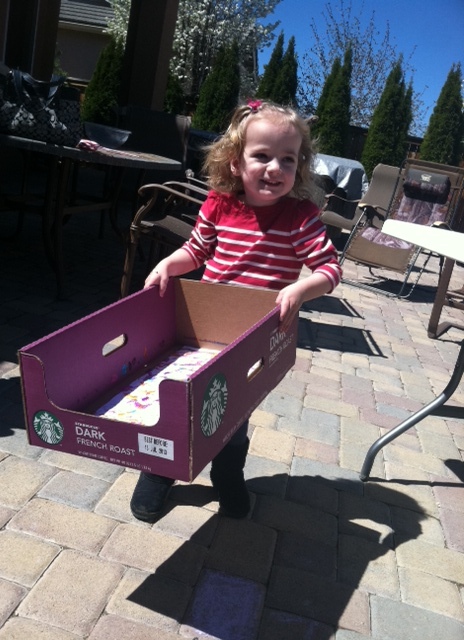 Once again, Addie had the time of her life, running around Kara’s backyard, painting, and eating more cupcakes. She needs a sugar detox after the week we had! 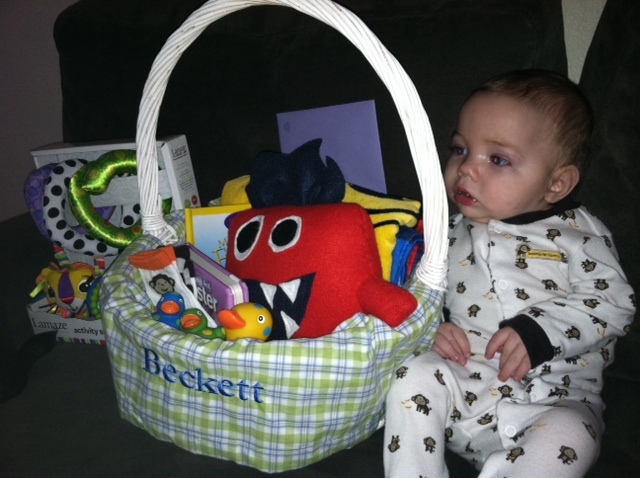 In Beckett news, he had another session with the vision specialist last week. I was at work, so didn’t get to be there, but Jimmy said he did better than the first time. I guess she said she’s not saying he definitely has CVI but is going to structure her therapies as if he does. 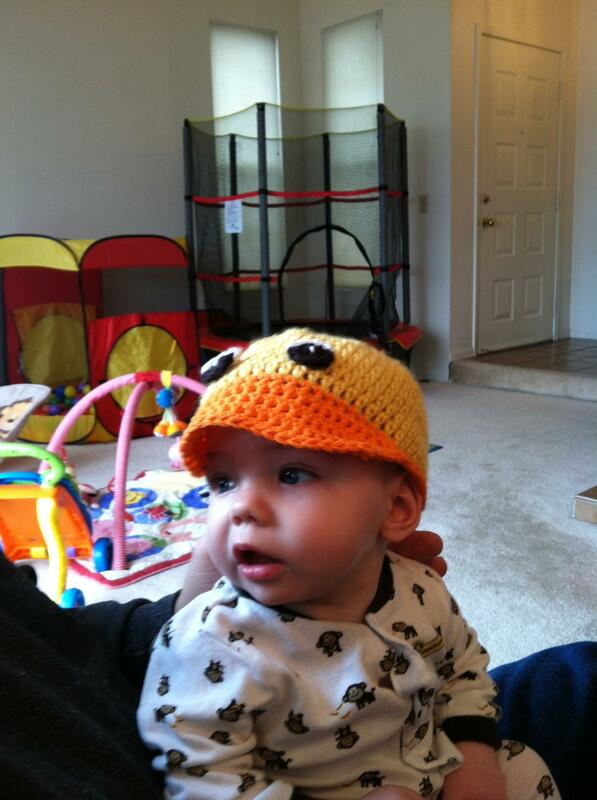 My amazing parents have scoured every dollar store in town finding bright and shiny things for him to look at. Last week, we also saw his developmental pediatrician again. We haven’t seen her since he was just a couple months old. We didn’t get anything new out of the appointment, but it was nice to hear that we’re not missing anything. She said to just keep up with PT and vision therapy and get him eating solids. This week, we saw our regular pediatrician just for a weight check (he’s 14 pounds, 8 ounces and 27 3/4 inches) and overall assessment. That went fine also, nothing new to report there. So an uneventful couple of weeks, but we’re finally past the stomach bug that was going around daycare, and can finally start making progress again. Oh, and Beckett’s second tooth popped through last Thursday! I tried to get a picture of it but he didn’t want to cooperate. Beckett and I took a much needed nap on Saturday and woke up to find that our little Addie had been transitioned into a big girl bed. We had been discussing for a while, but it really happened! 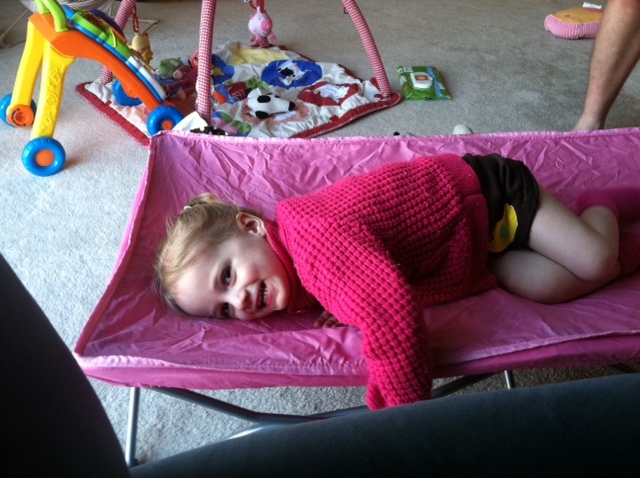 We put her pink travel bed next to it in case she rolls out, and every night since, she’s decided to sleep in that instead. Baby steps. And yes, those are her reindeer Christmas pajamas. Don’t judge! Oh Sweet Beckett, What Do You See? 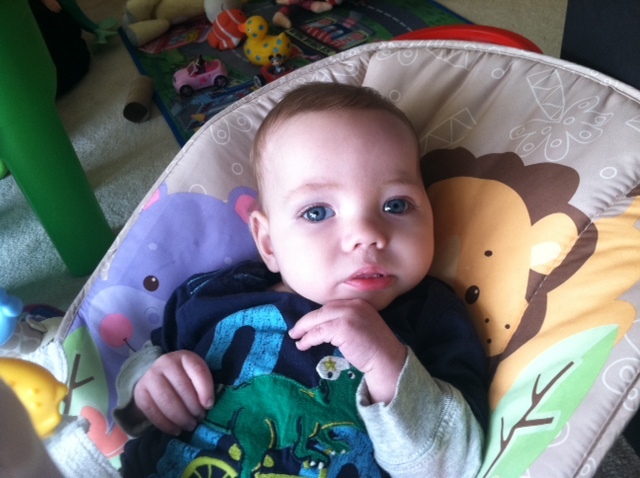 Beckett had his first meeting with a Vision Specialist this week. We saw an opthamologist back in January who said structurally, his eyes were fine. We took that as a big positive, but then shortly after (probably like a day or two later! ), while Googling HIE, CP, MRI results, etc., I came across a handful of posts on chat boards from parents of children in similar situations who had cortical vision impairment. The opthamologist, nor any of our other doctors had ever mentioned this, yet it seemed to be exactly what we’ve been seeing with Beckett. This made me feel a bit discouraged at the quality of care he’s getting. From what I read, if therapy starts early, the brain can build new connections for those missing pathways and vision can improve. The fact that no doctor had considered CVI as a possibility really concerned me. Not to mention, I felt like we were wasting time doing nothing! So, I asked our Developmental Specialist to set us up with the EI Vision Specialist. It took a couple of months, but finally we saw her this week. She brought a bag full of “tools” to our house – spiral gift ribbons, shiny sheets of duct tape, craft paper with black and white designs, some strands of silver Christmas garland, clear pouches filled with gel colors. Lots of interesting stuff for Beckett to look (or not to look) at. Our Dev. Specialist and PT came to the appointment too, which was very helpful to have another set of eyes and ears to interpret all the info. She started with the pouches. I am really not describing these well. They are like clear sheet protectors, but filled with water and colored oil-kind of lava lamp style-that moves around when she holds them up…does that help you get more of a visual?? One set was more simple – just red color, just yellow color, then one with red and blue dots that floated around. The other set had pink and green color, glitter, little shapes – a bit more going on. She said one set was for CVI and the other was for straight vision impairment. I really didn’t grasp which was which, but Beckett certainly preferred the more simple ones, plain color and the dots. The others seemed too busy and he did all he could to not look at them. We told her how much he loved outdoors so we took him outside and walked around. She seemed surprised at the things he focused in on, like the contrasting white trim on the house. He “scans” quite a bit, which she actually said is not really scanning but more of him switching focus. I guess scanning is what we want to build up to. Anyway, it was a lot of info, and I still am not sure what we should be doing to help him see better, but we have another appointment with her next week. Jimmy says she didn’t officially say he has CVI, but maybe his brain is still catching up. I felt overwhelmed so didn’t really process all that went on, plus had a squirming toddler on my lap wanting to read books the whole time, so I was a bit distracted. I couldn’t agree more. I see posts almost daily on facebook (yes, I’m a facebook stalker) from friends with kids around Beckett’s age doing all the things a child at that age should. I’m thrilled that they’re happy and thriving and meeting milestone after milestone, yet it’s a constant reminder of how far behind we’re falling. At the same time, I’m so thankful that we have Beckett here with us and that he’s making progress. I know he could be much worse off, or not here at all, so I accept the little blessings and pray for strength, progress, and patience. This “wait and see” is the hardest part, and quite exhausting, but we’ll get through it. I know this post is a bit more Debbie Downer than my usual posts. I really do try to keep our energy positive, but sometimes the endless doctor appointments and uncertainty get the better of me and I feel a little blah. Today is one of those days (though watching that Debbie Downer sketch helped a little!). Thank goodness it’s Friday! 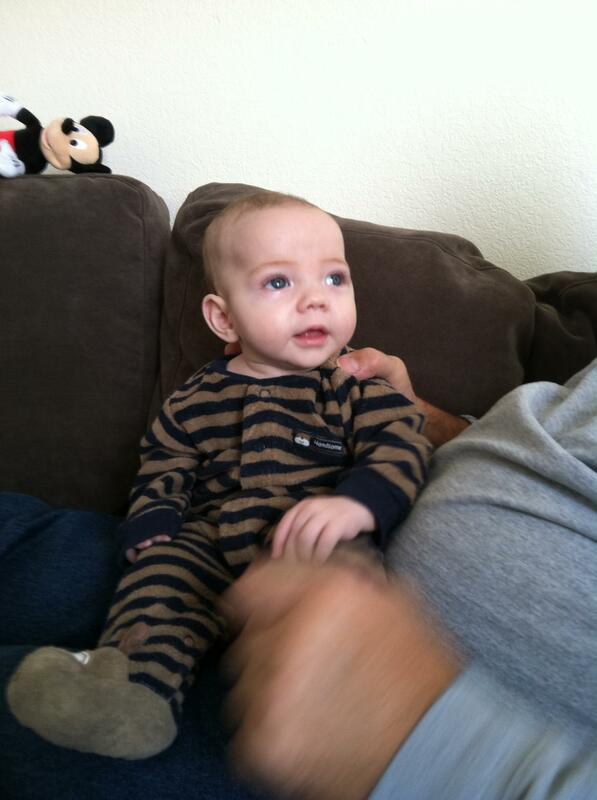 New Pics of the Little Man! Our favorite photographer Kendall came over a couple weekends ago and took new pictures of Beckett. 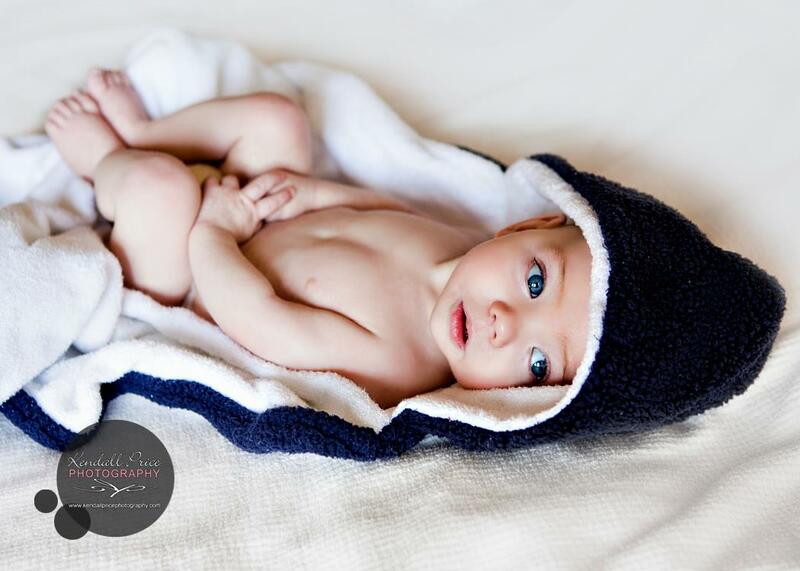 He was so well-behaved (unlike his sister at all her photo shoots!) and she got some really fun and adorable shots of him. Click here to see a few on her blog. Beckett’s first tooth officially popped through last Thursday. I swear, this little tooth has been hanging around just under his gums since about 2 months old. It looks like its next door neighbor tooth is ready to move on in as well. I’m guessing by next week, he’ll have two pearly gems to show off. 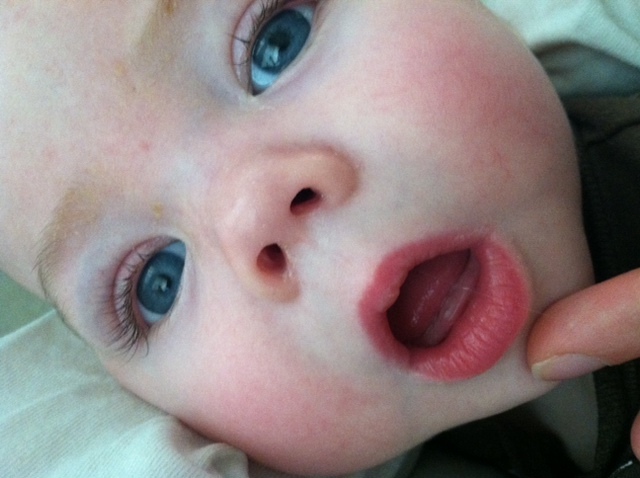 This is right on track (just about to the day) that Addie’s first tooth popped in (see a picture of hers here). 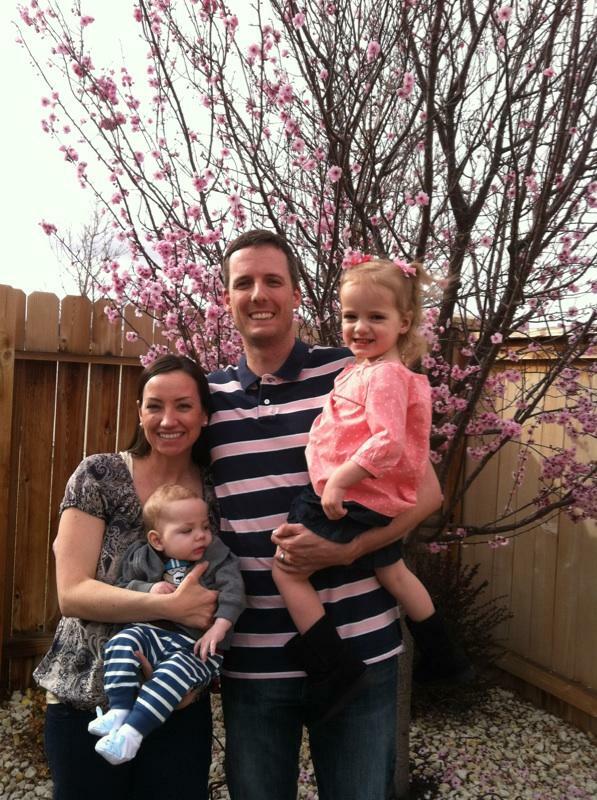 This past Sunday was Easter. Have I mentioned how much I love holidays? All of them! I love eating delicious food and being around family. I’ve been reading some blogs lately of friends who have moved to other countries and as much as I admire their adventures, I always wonder what their holidays are like. I like mine just as they are. 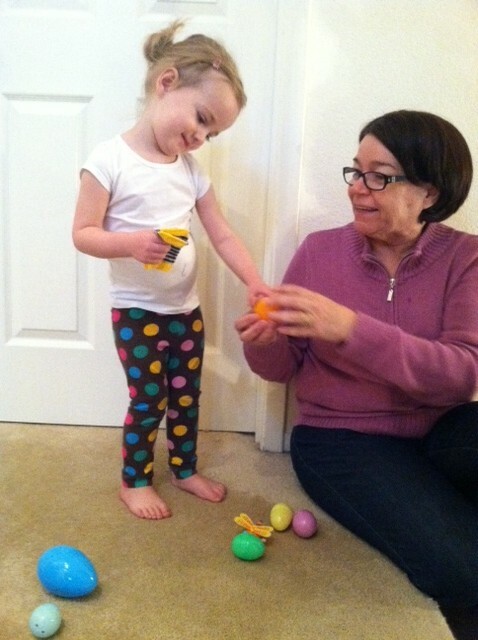 We woke up Easter morning and had my parents and Auntie Lyssa over for breakfast. We had cinnamon rolls (they gave Cinnabon a run for their money), egg casserole, cheesy bacon biscuits, and Jimmy’s classic potatoes. 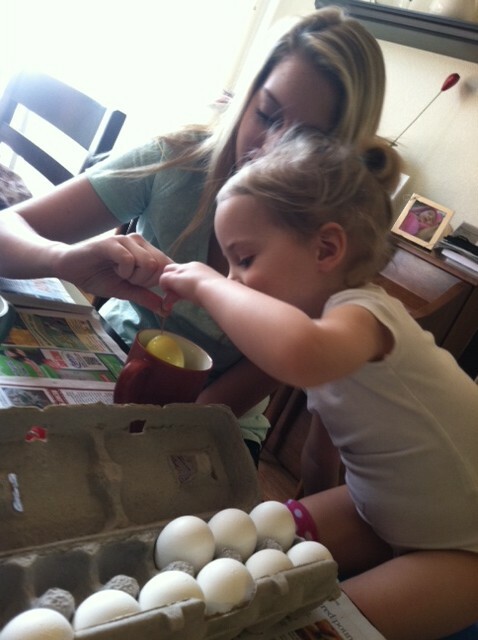 While I was cooking, Gram “hid” eggs for Addie. We were hoping to do it outside, but it was raining, so the stairs had to do. 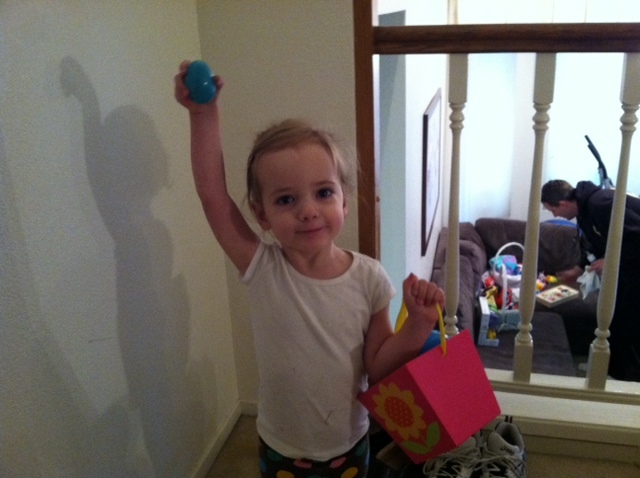 Addie loved it – didn’t even mind the eggs that were filled with socks for Beckett. 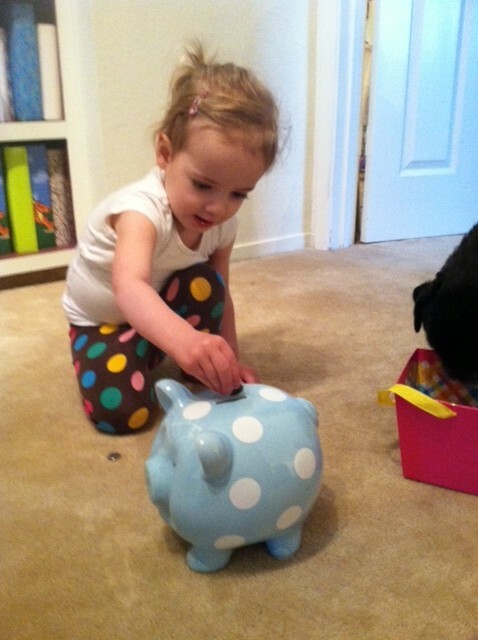 And, to prove to him at a later date that she really did share the loot, there’s a picture below of her filling his piggy bank. Of course, she had to be reminded to share the coins with him, but she did it willingly! We went to Aunt Trisha and Ed’s for a lovely dinner. Addie had a blast playing in the “jungle” which was really just a tree in the corner of the living room. 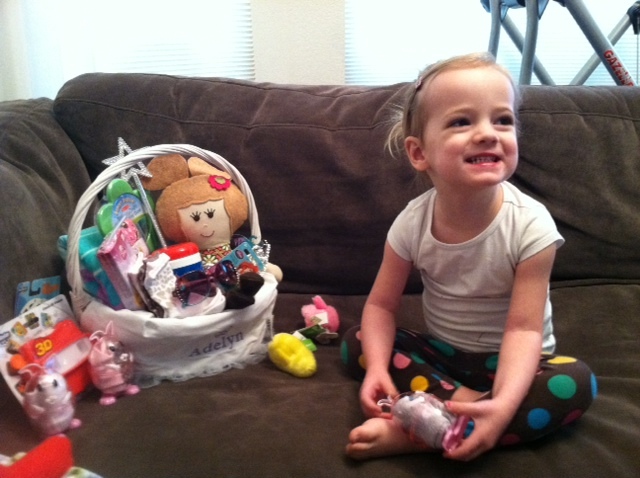 Aunt Trish also pulled out a huge tub of dolls for Addie to play with. 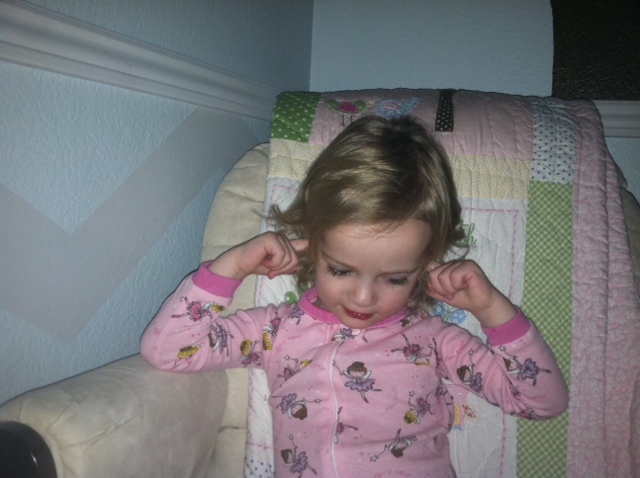 After that (and the coffee cookies she ate without anyone knowing they had coffee in them), Addie was wired until way past bedtime. She chattered non-stop until almost 9pm! Then Jimmy finally escaped her room and she fell asleep on her new pink travel bed (she’s been obsessed with this bed since it arrived on Thursday. 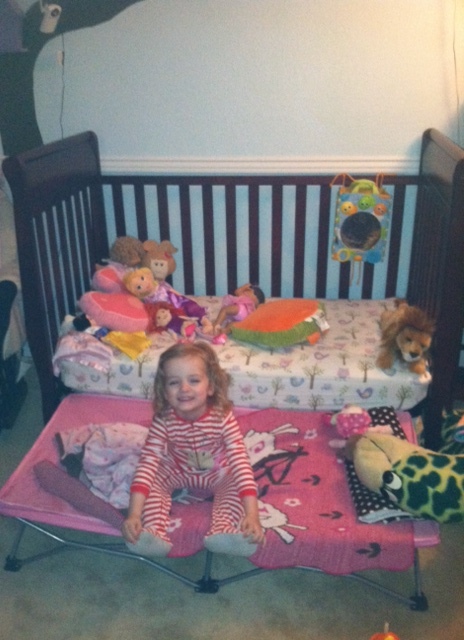 Last night, she finally went back into her crib. This is good news for our vacation coming up in May though!). Totally unrelated, but two funny things about Addie. 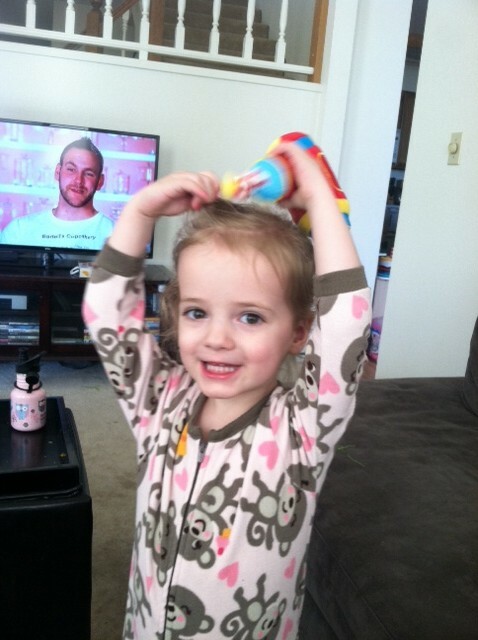 This weekend, she picked up Beckett’s drill and pretended to blow dry her hair.